This is our second event for the Heavenpreneur Summit. Our vision for this year’s theme is about taking dominion. God from the beginning of time gave us a command to be fruitful, multiply, reproduce and then subdue (rule and govern) the earth (Genesis 28). Then Christ gave us his commission to take Dominion by discipling nations (Matthew 28:18-20). 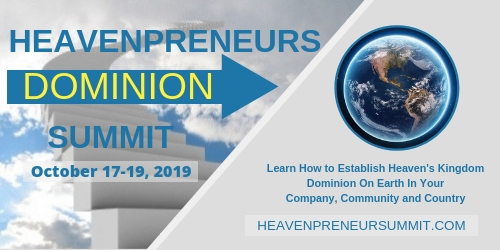 This year’s summit we are planning to equip and empower entrepreneurs, business owners, service professionals, marketplace ministers on how to take dominion in the areas of your revelations, operations, and calculations. So that, you can have greater dominion in your company, community and your country. How does this look practically you ask? In revelations, learn what could be hindering or sabotaging you from receiving Heaven’s revelation’s about your business or personal life; and then, how to take dominion by conquering through healing and deliverance processes. Learn which keys you can access to give you greater dominion in your own personal life, business, and marketplace. Learn how to walk in greater revelations to operate a supernatural business. As for taking more dominion in your finances is having an understanding of your calculations from Heaven’s perspective. Learn how to create wealth, protect wealth, steward wealth and more from a supernatural view and mindset. Then take dominion in your business and marketplace when you enter into activation and manifestation of Heaven on Earth. This is activated through partnership with Holy Spirit, Heaven’s Host, and know how to release your gifts in the marketplace. Our Venue will be announced soon. We are planning on having a livestream version available too for those who can’t make the trip to our physical location in Chesapeake/Virginia Beach, Virginia. Also, the speakers, sponsors, exhibitors and attendee information will be announced soon on our website at the HeavenpreneurSummit.com. You can register there to keep updated on when we will open up early registration and releasing venue location in Chesapeake/Virginia Beach, VA.